Readers of this blog will know the by now legendary challenge I have to get enough fruit and veg into the kids. Caitlin has always been reasonably good but Ieuan is proving more stubborn. Parents will be familiar with the general boredom that sets in when you have to listen to your own, largely ignored lectures about the health benefits of vitamins and minerals on repeat, whilst the kids languidly prod whichever gadget is in reach. So it is time to explore a new and sneaky way to get veg into them – and happily, the bakers at Blackberry Cottage have a cunning plan. 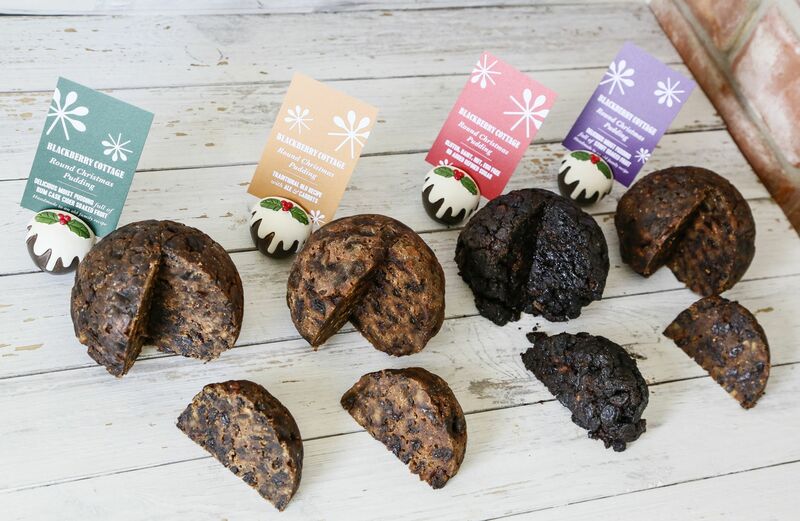 As they explain, vegetables in cakes have been around for hundreds of years – everyone has heard of carrot cake – but they have designed a whole range of vegetable cakes and tray bakes, as well as a delectable selection of Christmas puddings. Their cakes have vegetables as the biggest ingredient which allows them to reduce refined sugars and fats. They also use alternative flours such as rice and gram as well as the more traditional ones. Based in Berkshire, the team bake every day in their artisan kitchen. 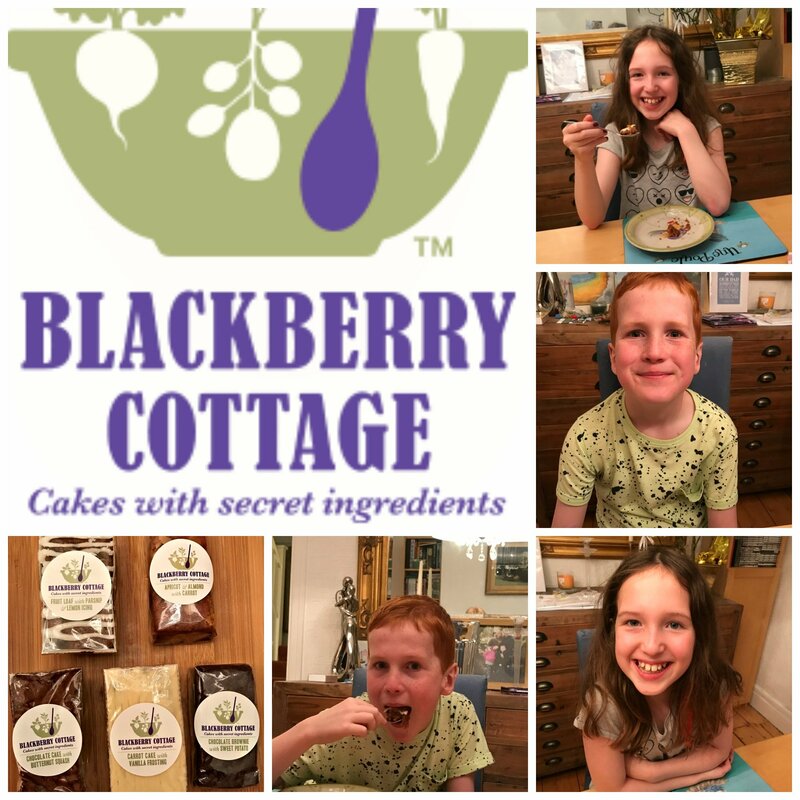 Blackberry Cottage cakes are hand baked in small batches using home grown or locally sourced supplies – and using eggs from their own chickens. We found all of them lovely and moist without being overly sweet. Whilst you can see the vegetables in the cakes, they are not the over-riding taste. This is brilliant because if you didn’t tell your kids what they were eating, I doubt they’d realise they were eating veg! My favourite was the Chocolate Sponge with Butternut Squash whilst the Husband liked the delicate taste of the Fruit Loaf with Parsnip & Lemon Icing. Caitlin and Ieuan both chose the Chocolate Brownie with Sweet Potato as their favourite. Enthused with this new method of eating vegetables, Ieuan announced he was now going to eat a Blackberry Cottage brownie every day. Cakes need to be stored in a cool dry place and you can freeze them too. Ours was the one full of Rum Cask Cider Soaked Fruit and it was a dense, rich pudding full of spices and surprises such as figs. The kids wolfed theirs down with Caitlin opting for her usual 3 pints of custard. Although you can steam the pudding (100 minutes), it also microwaves nicely in 3 minutes so that’s what we did and it worked fine. The cider used in our pudding comes from a local cider maker in West Berkshire using a variety of eating, cooking and crab apples which have been fermented and matured in oak rum barrels. The pudding we were sent was the 450g size which serves 4 comfortably but there is also a 900g which serves 8 and larger sizes are available. Our pudding came wrapped in muslin and finished with a pretty ribbon so would make a great gift too. 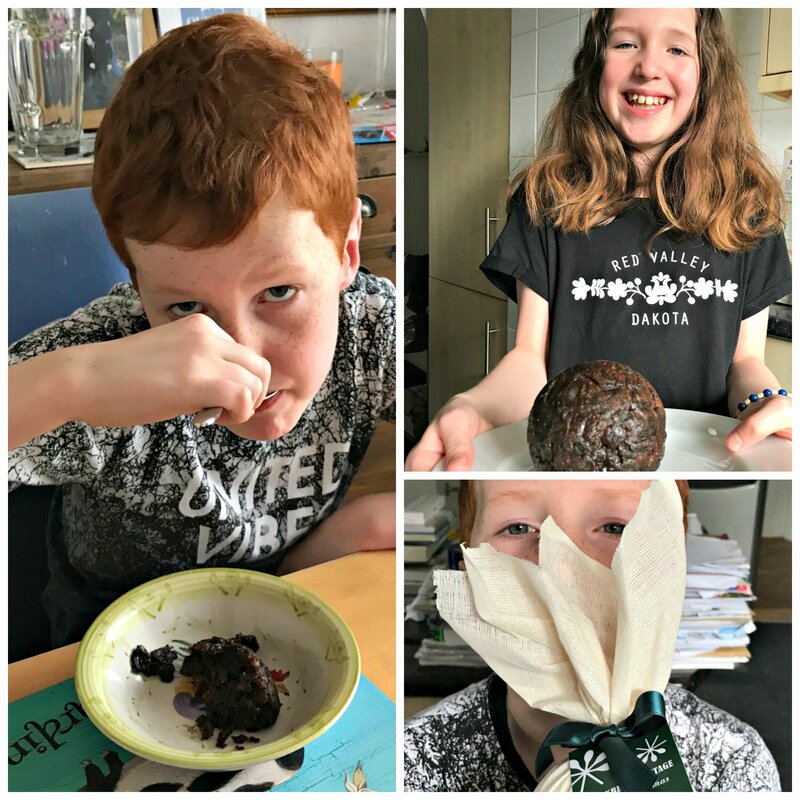 I’m not the only one who would eat Christmas pudding after Christmas, surely?! If you would like to learn how to incorporate vegetables in cakes, you can even attend one of Blackberry Cottage’s courses or demonstrations. I have to confess I’m not the only one to discover Blackberry Cottage. They have been featured in Vogue, The Daily Mail, Landlove Magazine, The Daily Telegraph and Healthy Diet Magazine, among others. You can find out more at www.blackberrycottagefayre.co.uk or email kate@blackberrycottagefayre.co.uk. Would you like to try vegetables in cakes – you’ll never know, I promise! "Fitting In Family Time Leading Up To Christmas"
Carrot Cake with Vanilla Frosting. My favourite – I mix in Cream Cheese with Pineapple into the frosting too. I would like to try the Lime Drizzle with Courgette. Carrot Cake with Vanilla Frosting. Apricot and almond with carrot slice. Fruit Loaf with Parsnip and Lemon Icing would be my first choice. The Carrot Cake with Vanilla Frosting! The fruit loaf with parsnip and lemon icing, yummy! Lime drizzle with courgette cake sounds scrummy! The chocolate brownies look and sound really moist and luscious. I love the sound of the Lime Drizzle with Courgette! The carrot cake with vanilla frosting looks delicious! Carrot Cake with Vanilla Frosting would be my choice! Chocolate brownies with beetroot sound yummy! The Chocolate Brownies with Spinach sounds interesting. Apricot & Almond with Carrot Slice for us, please! Oo all these cakes sound delicious! I am a big fan on Christmas pudding and this one sound like a real luxury pud (and sounds delicious too!). You had me at carrot cake. I would love to have that, its beyond one of my most favorite things in life! 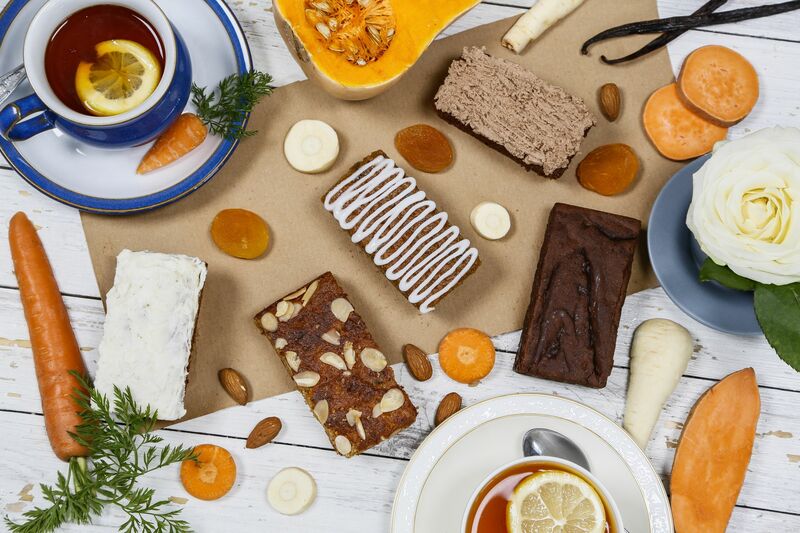 I would definitely love to try the Apricot & Almond with Carrot Slice. The chocolate cake and brownies. Definitely the carrot cake with frosting! The carrot cake with vanilla frosting sounds divine, but to be fair, so do all the other delicacies, so difficult to choose. Ale and Carrot Christmas Pudding Traditional Round wow! Chocolate brownies with sweet potato. My little daughter only ever seems to like eating bananas… Other fruit and veg is just a no go as far as she is concerned… But she loves sweet food, so these could be great! I would love to try the chocolate torte with aubergine. I think I’d go for the Chocolate Brownies! The Carrot Cake with Vanilla Frosting. I’d like to try any of the Chocolate Brownies, and the Apricot & Almond with Carrot Slice. I also commented on “Easy Waistline Friendly Winter Snacks You Can Make At Home”. Also commented on: The ‘No Make-up Selfie: Are We Being Taken In? Lemon, Poppy Seed with Sweet Potato sounds nice! The Lime Drizzle with Courgette….Mouth Watering, actually dribbling writing this blog! Chocolate brownie with sweet potato sounds yum! The Chocolate Brownies with beetroot look really tasty. The carrot cake with vanilla frosting is the one for me. I would like to try all of this especially the chocolate cake and brownie. Chocolate brownie with spinach sounds so intriguing. Carrot cake with vanilla frosting- im a sucker for carrot cake. Ooh, these look intriguing. I’d have to say the chocolate brownie with sweet potato! The lemon drizzle with courgette sounds interesting! carrot cakes with vanilla frosting. I would love to try either the Chocolate Brownies with Beetroot or the Chocolate Brownies with Sweet Potato. carrot cake with vanilla frosting!! The chocolate brownies with spinach sound really interesting. The chocolate cake and brownie box looks lovely as I am partial to being attracted to chocolate cakes.It’s not my fault my brain just takes one look and goes chocolate! There are some really interesting and delicious sounding recipies. Lemon, Poppy Seed and Sweet Potato cake sounds really good! The apricot and almond with carrot slice sounds delicious. The Chocolate Brownies with Sweet Potato sound very unusual. I am sure they would be delicious. The chocolate brownies with spinach definitely! Such a good idea! Lemon, poppy seed and potato cake – sounds amazing! Why can’t I have Christmas Pud all year round! Carrot cake with vanilla frosting is tickling my taste buds. They all sound delicious.! Apricot and almond with carrot slice looks so good! The carrot cake with vanilla frosting please. chocolate brownies with beetroot sound really funky! The Chocolate Brownie with Beetroot sound amazing! The Fruit Loaf with Parsnip and Lemon Icing sounds AMAZING! Lemon Drizzle with Courgette sounds an interesting mix…love to try it !! The Chocolate Brownies with Sweet Potato sound nice. Apricot & Almond with Carrot Slice but they all sound & look great. It has to be the sweet potato brownies for me. I think as well as sneaking veg in for the kids my fiance would also eat it (if I didn’t tell him what was in it) which would be amazing as it’s only of late I have managed to get him to try new things. Would love to try carrot cake with vanilla frosting! The apricot and almond with carrot sounds nicest to me. Would love to try Chocolate cake and brownie box. Wow, these are very different. But CARROT CAKE WITH VANILLA FROSTING and CHOCOLATE BROWNIES WITH SWEET POTATO sounds delicious. Congratulations Nancy – you are the lucky winner. Check your Twitter notifications! Chocolate brownies with beetroot sound delicious! Carrot cake with vanilla frosting sounds amazing…I LOVE carrot cake! I’d like to try the Lime Drizzle with Courgette cake. The ale and carrot Christmas pudding!